Turn on the news today and there’s no doubt you’ll see the headlines: A national boycott of Indiana in the wake of Governor Mike Pence signing the so-called Religious Freedom Restoration Act (RFRA) into law. Major companies—from Apple to Yelp—have spoken out. The NBA and NCAA issued statements strongly condemning the law. Major tech companies have pulled their investments in Indiana. And yesterday, thousands of people rallied at the Indiana Statehouse in strong opposition. Tomorrow morning at 10am, the House Judiciary Committee will decide if this same, harmful bill will become law in Georgia. 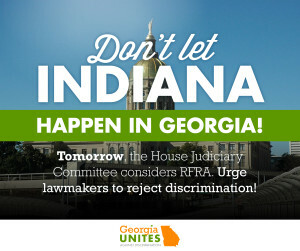 Tell members of the House Judiciary Committee: Don’t make Georgia the next Indiana! Click here to send a message and help stop RFRA before it’s too late for our state. RFRA is about discrimination—there’s no denying it. Don’t forget: When Georgia lawmakers amended RFRA last week to clarify that it cannot be used to undermine local non-discrimination ordinances, supporters of the bill said they couldn’t even support it. National boycotts? Millions of dollars of revenue down the drain? A political crisis? We can’t let our state go down this dangerous road. But unless we act soon, Georgia may very well become the next Indiana. Help defeat RFRA before tomorrow’s committee vote at 10am. Click here to send a message urging members of the House to reject discrimination against LGBT Georgians.